Exploring the cities of Europe is easy on foot or through public transportation, but if you really want to get into the hill towns and countryside you need to rent a car. You could take the train, but tickets for a family can add up and it takes the whimsy out of pulling over for a quick bite at a local restaurant, or detouring to that storybook whitewashed hill town you just passed. 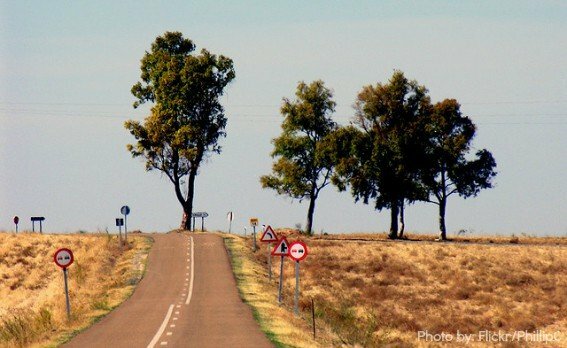 Spain is the perfect spot to test out your European driving skills. They drive on the right side of the road; you won’t have to challenge your brain with any left side driving. Break out of the prescribed guidebook route and see a bit of the country most tourists will never see when stuck on a train. My family did just this in the autumn of 2013, and I couldn’t be happier that we piled everyone in a van instead of taking multiple trains out of Madrid and around Andalusia. Not only did it give us flexibility, but it saved us a bundle in transportation costs. Be very mindful of is the car size you need. If a rental agency says the car can hold two adults and two children plus two small bags, that is all it can fit. You may be able to cram in a few backpacks, but if you have a third adult or child traveling with you, you will want to book a larger vehicle. Keep in mind that many rental agencies in Europe carry more manual transmission vehicles than automatic. If you don’t drive a stick shift, make sure you book in advance. You may need to pay more if you need an automatic, so shop around. Always double check what is include in your rental price. Does it include unlimited miles, insurance, and border crossing? Do you need to pay extra for an added driver? Do they offer car seats and a GPS system? Before you click the final confirmation, make sure you know the answers. Although many extras aren’t always necessary for a road trip around Spain, I would highly recommend renting a GPS for your trip. Our Garmin saved us more than once, but we did have to use a bit of common sense when the GPS told us to turn right down a street in Madrid that didn’t exist. The easiest way to book a car at a budget price is to go through a European-based comparison site like CarRentals.co.uk. Trekaroo also has an international car rental partnership with Rentalcars.com, part of the booking.com family. Editor’s Note: Check out Keryn’s best tips on car rentals and even read about her personal experience with selecting a rental car in Spain. 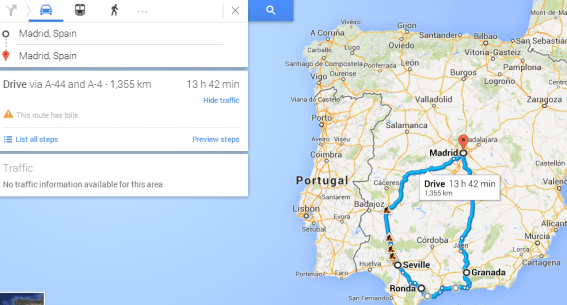 When traveling via car with your family through Spain for the first time, you do want a plan of action. Our two-week road trip consisted of four stops along the way—Madrid, Sevilla, Ronda, and Granada, before heading back to Madrid. Each included a two or three night stop in each city or town. The downtime was essential for our young boys, ages one and four, who craved some space to run around and explore the sights with us. And oh, boy were there sights to see. You can get direct flights to Madrid from the U.S. and spend a few days adjusting to the time zone before heading south in your car exploring Spain. The Royal Palace is a must in Madrid along with a trip to the Prado to see some of Spain’s most famous paintings and sculptures. There are plenty of parks to keep your little ones happy, but a favorite is Parque del Retiro. 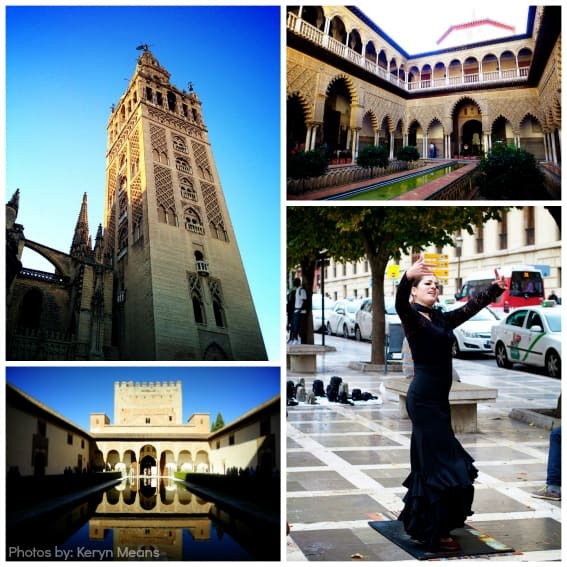 Sevilla and Granada are home to two giants in the Moorish architecture world—the Alcazar and the Alhambra. These two palaces show off the splendor of the Moorish civilization, giving us a glimpse of the opulence created when the Moors ruled Spain. Each palace deserves at least a day to explore. Keep in mind that if you want to see the Palacios Nazaries (arguably the most impressive part of the Alhambra grounds) you will need to get a timed ticket for that portion of the sight. Everywhere else you can roam at your leisure. Ronda is located halfway between Sevilla and Granada near national parks and is the largest of the whitewashed towns you always see pictures of when researching southern Spain. Ronda is home to bullfighting and one very impressive bridge that spans a gorge that cuts the town in half. If you like to hike plan a little afternoon walk down into the gorge just before the sunsets. Older children will be excited by the challenge, while parents should be prepared to carry younger ones up and down the slope in and out of the gorge. If you are feeling adventurous, or you want to skip Ronda, you can easily head down to the Mediterranean coast to enjoy Cadiz, Marbella, or Malaga on your way to Granada. Those wanting to avoid the crowds and loud city life can head to Nerja. It has the beaches so many people crave, and has maintained it’s Old World charm that other coastal towns seem to have forgotten. 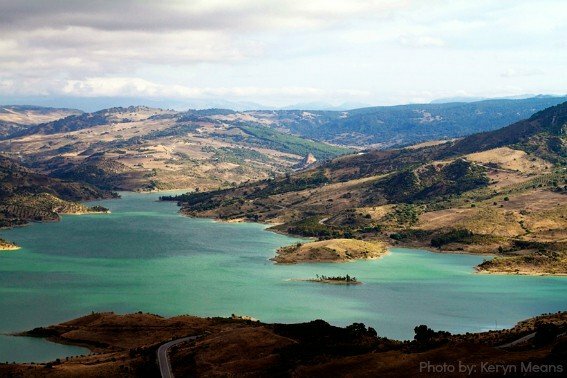 As you can see there is so much to see and do when exploring southern Spain by car; it will give you the flexibility to stop and explore, give the kids a break when they need it, and see a side of the country you won’t see by plane or train. Have your itinerary in mind, but don’t be afraid to detour up to a hill town, or down to the coast. We explored a small fort in the town of Zahara as we left Ronda, a spot we would not have been able to access by train had we not driven. It was an unexpected adventure, which are sometimes the most memorable parts of a trip. Keryn Means is a freelance writer and founder of walkingontravels.com, a site that gives hope to today’s modern parent who doesn’t want to stop their lives; they simply bring their kids along for the ride.You can find Keryn dragging her two boys around Seattle most days and across the globe several times a year.